Imagine if there was a way to set up SSL on your website in just one click. How cool would that be? Well with SashiDo and Let's Encrypt now you can easily achieve it! Let’s Encrypt is a free, automated, and open certificate authority (CA), run for the public’s benefit, and it is a one click option for your web app hosted on SashiDo. They let people and organizations around the world obtain, renew, and manage SSL/TLS certificates. Their certificates can be used by websites to enable secure HTTPS connections. We, at SashiDo, love what they are doing so we decided to give you an easy way to use their services when you use a custom domain name with your app in SashiDo. 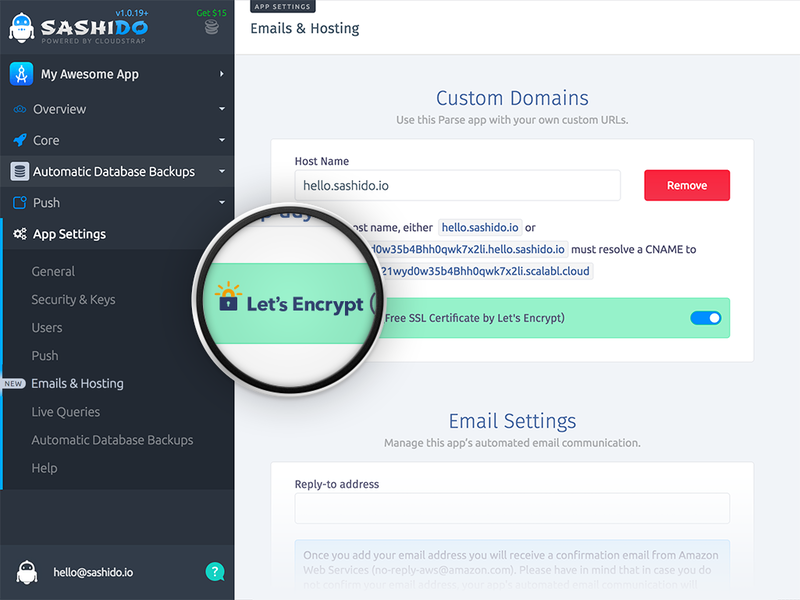 You can activate your Let's Encrypt certificate through your app dashboard -> App Settings -> Emails & Hosting. Let's Encrypt believes in and encourages automating as much as possible in system administrative work, so do we. That's why once you enable your certificate, we renew it when necessary, so you no longer have to worry about your SSL certificate anymore. You can check Let's Encrypt FAQ page for any questions regarding their certificates or contact us at support@sashido.io or via our live chat. We will be happy to answer all your questions.